Edgy and on-trend, this skull-embellished watch is perfect for those with a skeleton or two in their closet. The minimalistic design is current and contemporary, and free from traditional watch constraints such as numerals and bar markers. The haunting image will leave quite an impression, and will definitely be the talk of the town. 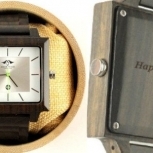 Beautifully handcrafted from ebony, this wooden watch features a fully adjustable genuine leather strap. Super cool and extremely distinctive, the Ebony Men's Watch from Angie Wood Creations is great for casual and smart-casual occasions. A perfect gift for those seeking an original watch design. 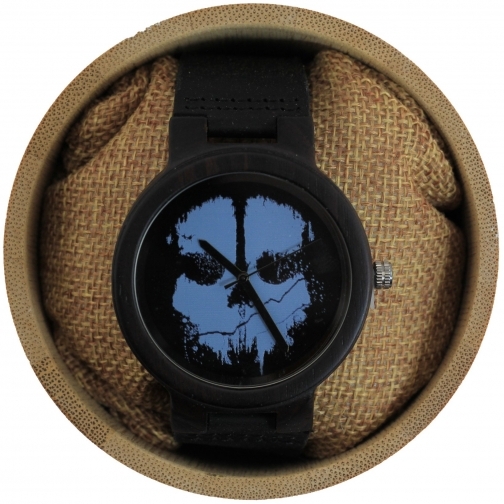 SKULL DESIGN: Offering a decidedly modern appeal, this ebony men's wooden watch with skull image is designed to fit your fashion needs. 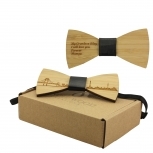 It offers plenty of artistic originality and will enhance and embolden your wardrobe. 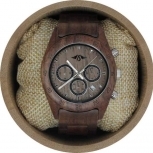 This trendy timepiece comes perfectly presented in a bamboo gift box to wow and impress. DEEP EBONY: If this watch came in any other wood other than ebony, it wouldn't work half as well. 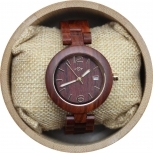 It offers the perfect mix of finesse and inventiveness, and is an ideal wooden watch to sport upon your wrist. 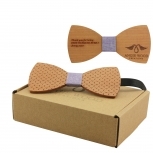 It is perfectly priced and has a playful appeal that men of all ages will appreciate. Totally daring and steeped in attitude, this is one watch you will love. LEATHER STRAP: So as not to detract from the amazing design, our skilled artisans have opted to add a fashionable genuine leather strap to each ebony skull-enhanced watch. This ensures the watch is both lightweight and comfortable which increases its appeal. If you are seeking something a little different when it comes to your fashion accessories, this is it! 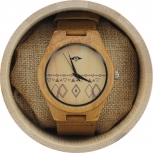 Well-known for our high-quality wooden fashion products, each wooden watch is created with care and meticulous attention to detail. Note that we use a chinese manufacturer for production, we design the watch along with them and they produce it. We then customize the watch to your liking ourselves, in our shop and then ship it directly to you, from our Shop in Deux-Montagnes, Quebec, Canada.